Friday Nov 5 I had the day off for some bowhunting on my Dad's place in the thumb of Michigan. 20 mph winds all day made the tree stand hunting exiciting with or without deer in sight. I haven't been seeing much since this season so I wasn't too optomistic. Fortunatly I did see about 9 does and a buck in the morning hunt with no shots taken. This was from my 2nd favorite stand for the area so that was a good sign. I went to my #1 stand for the evening hunt at about 3:00PM. Wind had blown a small dead birch onto my stand and was tangled in some vines making it impossible to shoot. Luckily I had my hand pruners and was able to cut the mess loose only waking one loud crashing noise that was no doubt muffled by the wind. About 3:45 I spotted a deer moving toward my stand at about 80 yards out. Due to the thick brush I was able to stand up and get the binocs on it to check it out. I could barely make out some real short spikes about 1-2" but they were attached to a good sized deer so I put down the glasses and got the bow ready. The buck came in on a quartering angle towards me. I was undecided if I wanted to shoot the spike or wait for either a doe or a bigger buck. I kept the bow up and followed the deer as he made a nice semi-circle in front of the stand to give me a long time to think about it. Just before he was past my last shooting lane he gave me a perfect slightly quarting away angle at less than 10 yards. The shot was right in the money as the arrow disapeared into the chest cavity right where I was looking. I was able to watch the buck run after the shot for about 40 yards and then heard a crash and could no longer see movement where I should've if he was still going. I waited a solid 15 minutes before getting down to take up the track even though I was sure the buck was down for good. I figured if I didn't like what I saw I would back off and wait. At the spot of the shot I was happy to see my arrow broken off just past the flecthing and covered with bright red blood. Not a very interesting blood trail. I didn't even need the blood to follow the leaves and brush displaced as the buck stumbled away but there was a lot of it. It wasn't long before I saw the buck's white rump sticking between a forked sapling that caught his final fall. Upon field dressing, I found the fletched portion of my arrow inside the chest cavity. Nice double lunger. 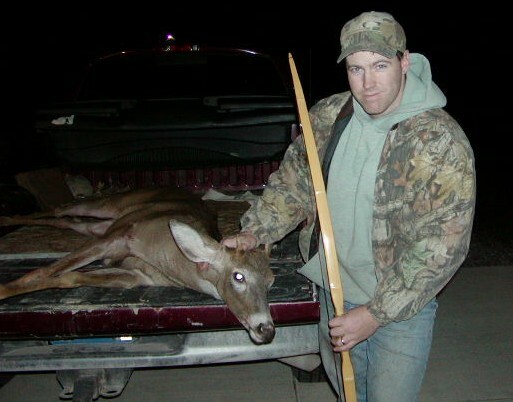 This was a special deer for me because it was my first with a bow of my own making. A BBO that I built from an Osage stave that showed some natural reflex through the handle section. I decrowned the stave and induced 4" of deflex during the glue-up. The bow is a dandy shooter with about .5" of reflex after a lot of shooting. I was using a 125gr Wensal Woodsman and cedar arrows I put together. He's a trophy in my book! Nice job! What's the Draw length and weight on your BBO,looks nice BTW. "Forget your lust for the rich mans gold all that you need is in your soul...Find a woman and you'll find love and don't forget son,there is someone up above...Ronnie Van Zant "simple man"
Thanks. It pulls 60 @ 27. That's about as good as it gets. Congrats!